DIGITAL2018 was the starting signal for a cross-sector initiative of Deutsche Telekom AG which aims to actively shape digitalization instead of running after it. 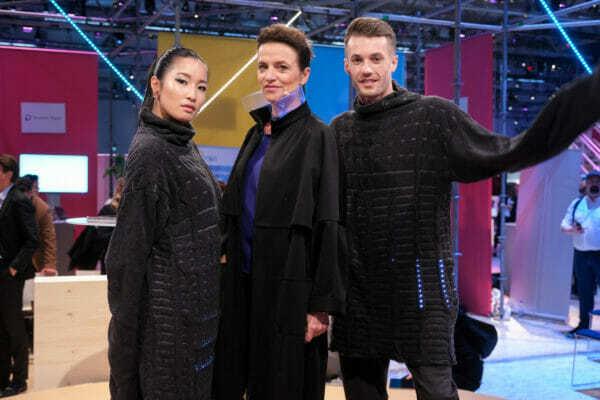 As part of Telekom Fashion Fusion’s appearance at DIGITAL2018, Antje Hundhausen presented the two winners Keypod and Interknitting as well as the work of the design studio Wearable Media. On the podcast of Deutsche Telekom, Antje Hundhausen speaks about the new brand experience platform (5:00 – 5:55 min). Feel free to listen (German) here. Wearable Media is an NYC based fashion technology design studio delivering cutting-edge, interactive smart apparels, creating a world of futurist fashion powered by design and technology. Yuchen Zhang and Hellyn Teng are the Co-Founders of Wearable Media. Together they encompass high aestheticism and innovative processes, connecting both design and technology, which has forged pathways in making Wearable Media possible. Two of their newest products were presented at DIGITAL2018: AudRey and METER. AudRey is a garment that analyzes Instagram accounts to reveal the wearer’s digital “aura” by combining combines augmented reality and 3D textile printing technology. Besides they introduced their new streetwear collection: The METER jacket is enhanced with sound interactive technology, designed to visualize and illuminate sound around you.